Corrosion is a naturally occurring phenomenon commonly defined as the deterioration of a substance (usually a metal) or its properties because of a reaction with the environment. Like other natural hazards such as earthquakes or severe weather disturbances, corrosion can cause dangerous and expensive damage to the world’s infrastructure, including bridges and highways, buildings, pipelines, tanks, and water and wastewater systems. Unlike weather-related disasters, however, corrosion can be controlled, but at a cost. Various time-proven methods for preventing and controlling corrosion depend on the specific material to be protected; environmental concerns such as soil resistivity, humidity, and exposure to salt water or industrial environments; the type of product to be processed or transported; and many other factors. The most commonly used methods include organic and metallic protective coatings; corrosion-resistant alloys, plastics, and polymers; corrosion inhibitors; and cathodic protection—a technique used on pipelines, underground storage tanks, and offshore structures that creates an electrochemical cell in which the surface to be protected is the cathode and corrosion reactions are mitigated. Over past decades there have been significant studies in various parts of the world on the costs associated with corrosion control and how it affects a country’s economy. The often cited 2002 U.S. Federal Highway Administration study, “Corrosion Costs and Preventive Strategies in the United States,”1 revealed that the total annual estimated direct cost of corrosion was $276 billion—equivalent to approximately 3.1% of the U.S. Gross Domestic Product (GDP). Studies in other countries have shown a similar percentage of GDP. In 2014, NACE International—The Worldwide Corrosion Authority embarked on a new global study that went beyond the economic effects of corrosion; it emphasizes how to integrate corrosion technology with organizational management systems. By doing this, corrosion decisions are optimized with respect to both cost savings and concern for safety and the environment. Released in 2016, IMPACT—the International Measures of Prevention, Application, and Economics of Corrosion Technologies study2—determined that the global cost of corrosion is US$2.5 trillion, or 3.4% of a country’s GDP. The IMPACT study identifies and describes corrosion control strategies that could save hundreds of billions of dollars per year. The study determined that reducing what continues to be an astoundingly high cost of corrosion requires a change in how decisions are made. While it is important to continue investment in technology for corrosion control, putting this technology into an organizational management system context and justifying corrosion control actions by business impact is essential. The full findings and recommendations of IMPACT are available at impact.nace.org. Building on the importance of these groundbreaking findings, the NACE International Institute (NII), an affiliation of NACE International focused on helping companies improve their performance with corrosion management systems and certification of personnel, embarked on the development of IMPACT PLUS, the world’s first platform to benchmark practices and improve corrosion management across all industry sectors, from pipelines and bridges to maritime and defense systems. Working with the American Productivity & Quality Center (APQC)—the world’s foremost authority in benchmarking, best practices, process and performance improvement, and knowledge management—the NII developed IMPACT PLUS as an online network of tools, including a customized corrosion management process classification framework, corrosion management maturity model, and an extensive reference library. 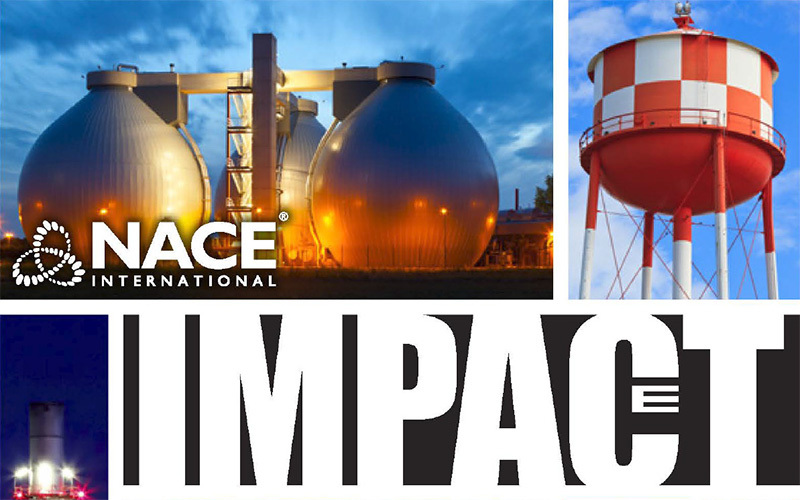 IMPACT PLUS users have the option to manage their own use of the product or work with a trained navigator with corrosion management and consulting expertise. Navigators help customers evaluate and compare their current asset management processes and advise them on future asset protection and corrosion management strategies. 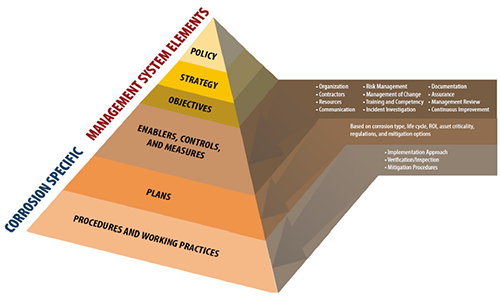 ‍The corrosion management strategy pyramid, which is central to the findings of the IMPACT study. 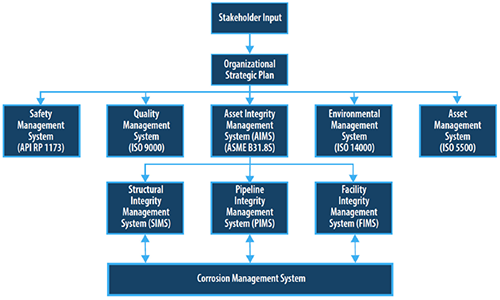 Realizing the maximum benefit in reducing corrosion costs—both direct and consequential—requires more than technology; it requires integrating corrosion decisions and practices within an organizational management system. IMPACT PLUS is the tool to make this happen in any organization, no matter what the size. For more information about IMPACT PLUS and to get started with the program, visit www.nace-impact.org. G.H. Koch, et al., “Corrosion Costs and Preventive Strategies in the United States,” FHWA RD-01-156 (Washington, DC: FHWA, 2002). G.H. Koch, et al., “NACE IMPACT, International Measures of Prevention, Application, and Economics of Corrosion Technologies Study” (Houston, TX: NACE International, 2016).